I learned a lot when training for my esthetics license. When I began my schooling, I was still in the grips of a tanning-bed obsession. I was bronze—in the middle of January, no less. During one of our very first classes, our instructor had us crowd into a pitch-black closet and check out each other’s skin using a blacklight, which shows sun damage long before it is visible on the surface of the skin. Have you been living under the assumption that, if you had sun damage, you would be able to see it? So was I. And yet, there I was with the naked truth written all over my face; I had inflicted a huge amount of damage on my skin—most of which I wouldn’t see for several more years. Mine was even worse than some of the women in the class who were significantly older than I was at the time. It’s easy to put things out of our minds when they are not literally cropping up on our faces. The summer is coming to an end and we know that you’ve been listening to our pleas for more vigilance in the sun. It’s difficult, though, to be perfect all the time. We know that sun-related skin discoloration happens. We’re not expecting you to wear a face-kini, after all! Our Whitening Mask is great for brightening up uneven skin tones. 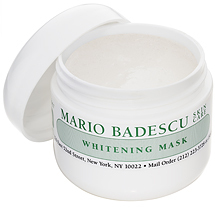 We use ingredients like Kojic Acid so that even those with active acne and sensitive skin can benefit from this mask. Now if you’ll excuse me, I need to go use my Whitening Mask. Which mask are you using?